This premier hotel has a wonderful setting on the sea front overlooking the azure sea and comes highly recommended. The Luna is situated just 500 metres from the centre of Golden Sands and linked to the golden beach by about 80 steps. This was my 6th visit to Golden Sands in 5 years. The Hotel is very clean and the sea view room was worth paying the extra for. The pool area has plenty of sunbeds available throughout the day. The food is edible but I chose to eat out most nights as the food is the resort is cheap. I spent my nights and La Bomba (just past Astoria Beach Hotel). The lads in there are really friendly and the singers are fantastic. Please say hello to them from Caroline (the Evertonian) if you visit. Golden Sands hasn't changed much over the past 5 years. 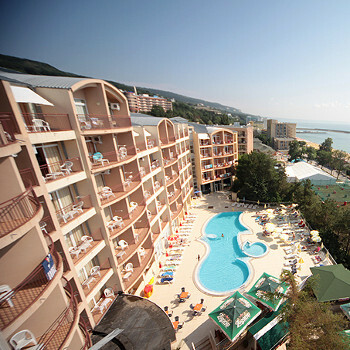 The Bulgarian people are really friendly and the resort itself is clean and tidy. Bulgaria really is a piece of heaven on earth. I look forward to seeing you all again in 2008 - I'm counting down the days already!!! We stayed at the Hotel Luna in Golden Sands Bulgaria. We booked this hotel based on reviews from this web site and were not disappointed. The hotel was spotlessly clean. The room was cleaned daily with towels changed whenever you wanted. The room was spacious which was unusual for a 3 bedded room. Bathroom had bath as well as a shower. The breakfast buffet and evening buffet was excellent. The food was freshly cooked and hot and there was an excellent choice. This was varied and different meat dishes each day. The hotel Luna was set back off the promenade and there were a number of steps down which might be difficult with a pram or a buggy. The swimming pool in the hotel had a children's pool (although the water was very cold). We didn't use the indoor pool as the weather was so good, but it looked excellent. We upgraded to Luna hotel excellent position on the beach front, staff friendly variety of food. Rooms very spacious and cleaned daily. The pool isn't very large but we used one in front of hotel. We sea view just had to pay for use of the beds, they have waitresses coming round so you can just lie back and enjoy the sun. Booked to return to this hotel next year. We have just returned from a week at the Hotel Luna. The overall standard of the hotel was excellent and the staff were friendly. The rooms were cleaned every day and the cleaner even arranged the sheets in pretty patterns! Make sure you use the Do Not Disturd sign though as they tend to come VERY early!! The food was good for buffet style. There was plenty of choice and it was usually vaguely warm! The only problem we found was getting a sunbed by the pool. The germans are up very early and take them all! There is a pool over the road and although you have to pay for sunbeds, it is well worth it. It was the cleanest pool I have ever seen! The entertainment at the hotel is virtually non-existant. Just a man with a keyboard every night! There is plenty of entertainment in the resort though and it is much cheaper to drink out. We found drinks in the hotel to be expensive compared to the bars in the resort. We would definitely go to this hotel again.